The Xbox 360 is the second video game console released by Microsoft, after 2001's Xbox. It was released on November 16, 2005, 1462 days after the original Xbox. 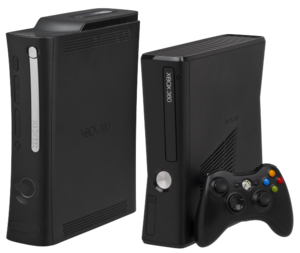 The Xbox 360 competes against the Nintendo Wii and Sony PlayStation 3. All three are called "next-generation" or "seventh generation"[source?] consoles. The Xbox 360 was officially revealed on MTV on May 12, 2005. The successor to the Xbox 360, the Xbox One, was announced on May 21, 2013. Even though the Xbox One was released on November 22, 2013, the Xbox 360 continues to be sold. Before Microsoft revealed the console's real name, it was called the Xbox 2, Xenon, Xbox Next, NextBox and other names[source?]. During the development, Microsoft, said it would launch the "High-Definition" era for video game consoles, promising visuals (looks) that would look better and much more real. The Xbox 360 uses standard DVDs to play games and other media. The Xbox 360 was released in the United States and Canada on November 22, 2005 in Europe on December 2, 2005, and in Japan on December 10, 2005. It was later launched in Malaysia, Mexico, Colombia, South Korea, Hong Kong, Singapore, Taiwan, Australia, New Zealand, South Africa, Chile, India, Brazil, Poland, Czech Republic, and Russia. When the console was first released in North America, demand was more than the supplies and the console sold out at many stores. Many people sold the console on eBay for higher prices, and it was not until early 2006 that the Xbox 360 became more available in stores again. "Xbox 360 Core" – this was the first basic package of the Xbox 360, featuring only the console and a wired controller. This has been discontinued and replaced by the "Arcade" as the cheapest model. "Xbox 360 Arcade" – this was the second basic package of the Xbox 360, featuring only the console (with HDMI output capabilities), a wireless controller, a 256 MB memory card, 5 Xbox Live Arcade games and Standard-definition video cables. "Xbox 360" (commonly called the "Premium" or "Pro") – this package was featuring the console (with HDMI output), 60 GB hard drive, wireless controller, Ethernet cable, headset, High-definition video cables and one month Xbox Live Gold trial. "Xbox 360 Elite" – this was the most expensive package of the Xbox 360, featuring a black-colored console (with HDMI output), HDMI cable, 120 GB hard drive, headset, wireless controller, Ethernet cable, High-definition video cables and one month Xbox Live trial. "Xbox 360 Slim" - Piano Black (Matte Black on the 4 GB console), HDMI, 250 or 120 GB HDD and 4 GB SSD, headset (120/250 GB consoles only), wireless controller, ethernet cable, HD video cable, one month Xbox Live trial. A number of accessories can be purchased for the Xbox 360. These include both wired and wireless controllers, custom faceplates that cover the front of the console, headsets for chatting while online,a webcam, a steering wheel for driving games and various other accessories. Kinect is a major accessory that Microsoft is planning for the Xbox 360. It is a new way to control games without a controller. Kinect is being developed, and may be in stores in late 2010. It has already won many awards. When it was first being made, it was called Project Natal. The Xbox 360 is a multimedia console. It can play music and videos streamed or downloaded from a computer. It can also play DVDs and HD-DVDs if a HD-DVD Drive is connected. The Xbox 360 plays games on either a disc or on its hard drive. There are many games for Xbox 360. The NXE (New Xbox Experience) update had many new features. One new feature is an avatar system. You can make the avatar look like you. The avatar is used in games and more. The menus were changed too. The NXE shows your friends and what they are doing. Another new feature is the ability to add people to an Xbox Live Party. People can talk online in a party. It does not matter if you are on the dashboard or playing another game, up to seven of your friends or anyone else can join a party. Another option is to add friends to the party and game, which will invite them to both your game and party. Xbox Live now has Facebook, Twitter, and Last.fm. You can use them on Xbox Live, but some features are different. 1080p High definition movies are also on Xbox Live. You can pay to download them. The most recent update on the 360 was allowing users to input a USB memory device, allowing USB drives with memory over 1 GB to be used for storing data such as avatar items, or game saves, up to a maximum of 16 GB of data. The white Arcade console breaks down a lot. When this happens, what is known as the "Red Ring of Death" (RRoD) appears: three of the four warning lights surrounding the power button on the console flash in red. The Red Ring of Death shows that there is a hardware problem, which usually means that the console no longer works. On later models (for example, the Xbox 360 S), these three lights show that there is an over-heating problem. ↑ "Earnings Release FY13 Q1". Microsoft. Retrieved October 18, 2012. ↑ Tim Stevens (March 9, 2011). "Microsoft sells 10 million Kinects, 10 million Kinect games". Engadget. Retrieved March 10, 2011. ↑ Padilla, Raymond (2005-03-08). "We Got Next—Part One (Xbox)". GameSpy. Retrieved 2018-03-06. This page was last changed on 23 January 2019, at 22:19.